We're less than eight weeks away from Destiny 2: Forsaken. That means we have eight more visits, including this one, from our buddy Xur, Agent of the Nine. This week, Xur has three armors from the Curse of Osiris expansion, plus a weapon that was once a pre-order bonus. Let's take a look at his wares for the weekend of July 20, 2018. 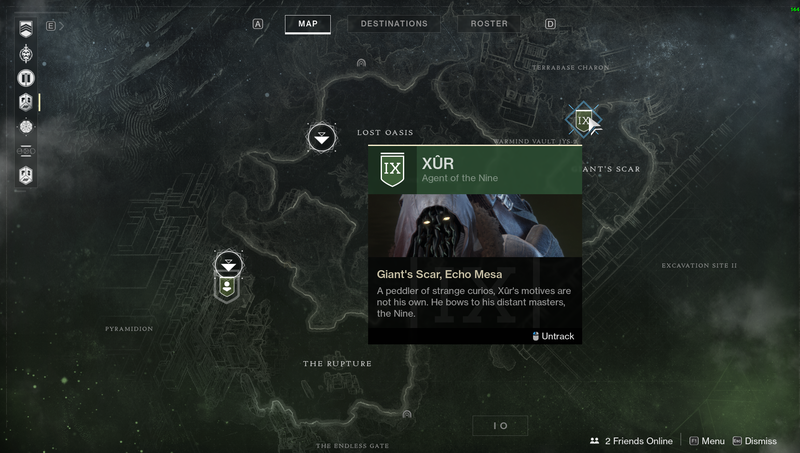 This weekend, Xur is on Io. He's in his normal spot in the Giant's Scar section of the map, to the east, tucked into the corner of a dark cave. This week's weapon is Coldheart. This trace rifle was once a pre-order bonus, but it's now available to everyone. It fires a cold fusion-powered laser that does exponentially more damage the longer it remains on a target. Xur is selling it for 29 Legendary Shards. 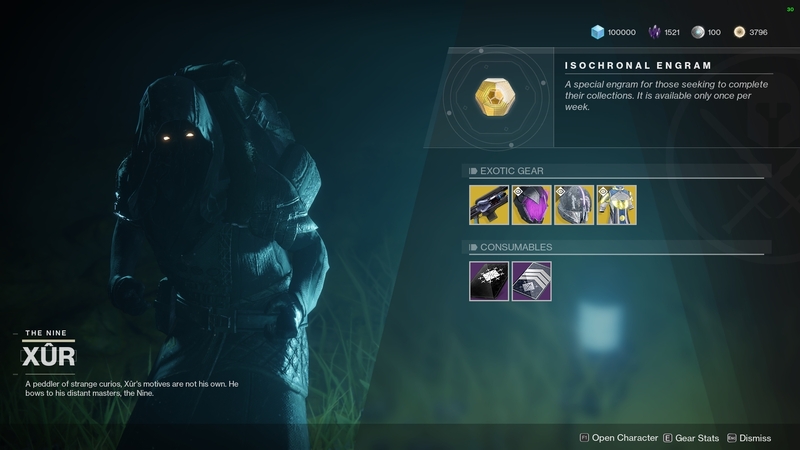 For Hunters, Xur has Graviton Forfeit. This returning Destiny 1 helmet increases the duration of any invisibility effects and also recharges melee abilities faster when you are invisible. It costs 23 Legendary Shards. This week Titans get Helm of Saint-14. Another Destiny 1 helmet, this one grants your Ward of Dawn the ability to blind enemies that enter into it. Guarding with Sentinel Shield will also temporarily blind nearby enemies. It's on sale for 23 Legendary Shards. Finally, Xur has Vesper of Radius for Warlocks. It's a chest piece with a perk that makes Rifts release an Arc shockwave when cast. Rift energy will also recharge faster when you are surrounded by enemies. It costs 23 Legendary Shards.